Engineers Put Wood House to the Quake Test A team of engineers has built inside a lab a house that mimics the style of those found in quake-prone California: wood frame with a stucco exterior. The University of Buffalo team wants to see if they can improve the durability of houses in quake zones. Cameras capture the stress on a two-story wood-frame house put under the pressures of a simulated magnitude 6.7 earthquake. In Buffalo, N.Y., a team of engineers is sorting through the debris inside a two-story wood-frame house that was struck by an earthquake. It was the only house in Buffalo hit by a quake, because the engineers built the house on top of a pair of tables that simulated a real earthquake. The house was built to mimic the style of houses in quake-prone California: wood-frame with a stucco exterior. 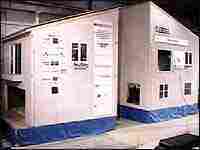 The University of Buffalo engineers want to see whether they can improve the durability of houses in quake zones.